There has been much excitement around the Firehouse this past year. The department’s Instructors have been teaching an Emergency Medical Technician course at the Vollies Memorial Training Hall since February. This class will give the department 6 new EMTs to ride the ambulance. There have also been many new firefighters in training along with many new dispatchers. Special Services has been activated so that everyone can offer their expertise to assist the department in their new growth. We are very happy to have past members join us again to share their expertise. October 2010 began our 2011 annual fund drive. Letters requesting donations were delivered to the doors of over 2,000 homes and businesses in Gerrittsen Beach. Also, in October our Officers and Fire Council were elected into office. The Chief, John Czap and our Corporation President Vincent Mezzatesta have been directing the department since our Installation of Officers ceremony that was held during the Holiday party in December. This month, our annual payment of $29,733.12 is due for the Community Fire Truck. Insurance payments of $29,000.00 are paid through the year for liability for the trucks and buildings. Supplies, equipment and operations run a costly $50,000.00 annually. These expenses cannot be paid without your help. To date a total of less than 20% of the total homes and businesses have donated. Save the dates; April 9 and 10th from noon-3pm is a weekend to Learn more about the volunteer fire service in your community. Volunteer NY will be held at the firehouse. All local volunteer fire services will be joining us all over the state. The entire community is welcome to come by. On June 18th at 9am, we will be hosting a blood drive in our training hall. On June 24th at 7pm in the Cort Club, we will hold our annual Chinese Auction. Your support is necessary to keep our unique organization afloat. 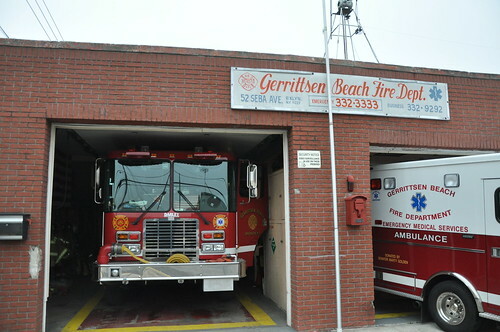 Gerrittsen Beach Fire Department is the only Volunteer Fire Department in Brooklyn. Please take a moment to send in your annual donation in the enclosed postage paid envelope. Golden donor this year is $85.00 but every donation counts towards our fundraising efforts. Please send what ever you can as soon as possible. If you have already donated this year, thank you . You will be receiving your fund drive sticker in July, after our fund drive is closed for 2011. We need more participation from our GB residents (both monetary and time) in respect to our valuable Volunteer Fire Department. Happy St. Patrick’s Day to all!!! !